After creating my mini portfolio from an unused Filofax binder I decided to make some matching business cards that I could give out to prospective clients. I decided to go down the handmade route as I wanted to be able to showcase my work and my creativity too and for the cards to stand out from others and be memorable. I started off by printing my images onto photo paper as a contact sheet and cutting them down to size. I then mounted the images onto black cardstock and cut them out with scissors leaving a small edge around the image. I mounted these images onto unused black and white 35mm film – the use of this was to add texture while linking the images to photography and what I do – it shows my job role even before the reciever reads the blurb on the card. I then cut some black cardstock to size using a guillotine and typed up what information I wanted on my business card – I included my business email, mobile number, blog and Facebook page. I left off my etsy and Instagram, deciding that if the reciever was that interested and went to any of the sites mentioned they could soon find the rest of my sites. I duplicated the information enough times for the amount of cards I needed using word on the PC and printed it all out on normal white paper. 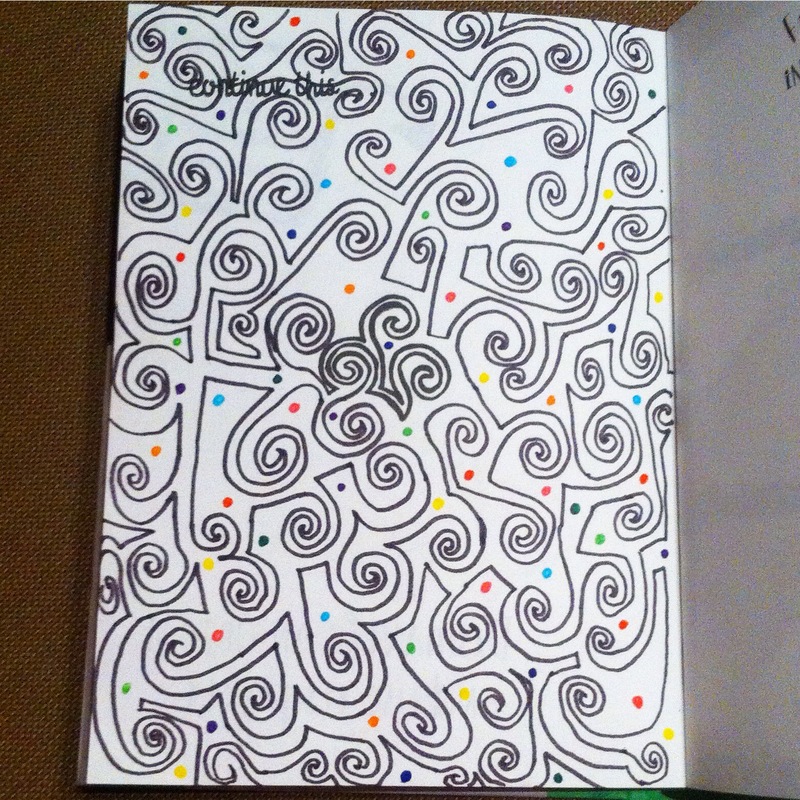 I then cut the information out and stuck the information for the back of the card to the cardstock already cut. I then added the prepared images of my work and decided where to place them on the front of my cards along with the the front information. I decided to make each card slightly different and unique. I have been exploring some ideas about projects that I have lined up for the future and how I want to execute them and so far have a few that see me returning to photography another that will possibly be produced in a drawing format and one that may include elements of collage and embellishment. The first project I am keen to start on revolves around memories, a subject that my final piece for my Foundation Art degree focussed on, and will see thoughts and ideas developed from that project getting pushed further forward. (the posts for this original work can be found here and here ) However, after doing a bit of thinking about the final outcome I would like, what format would suit the subject, what I am trying to portray and the direction I would like to take this project in, I have decided that I’d like to create images via photographic means. I would ideally like to shoot with 35mm film in black and white but have lost the facility to develop and print my own images, and sending off film to be developed can be pretty slow, I think I may use a digital camera to take my images and then use editing software to get the right feel for the image. The other photography project I am thinking about is to do with self portraits and self-representation, again drawing on previous projects…this one drawing from research that I undertook toward the beginning of my Insta Rips and Anti Social Media degree project. I want to investigate further, what constitutes a self-portrait, if they are a fair representation of ourselves and if there are other means of self-representation that are more true to our person. I have already decided that I would like to use photography as my means of image capture as it is the means we now seem to favour when creating a self-portrait over painting and drawing. I am considering using my phone for this project in order to share freely my images on social media in order to gain feedback and ask questions of the viewer and their perception of the image. A spin-off from the self-portrait/representation that I have been thinking about is to do with personal information, the data that follows us around and is part of us and our digital make up, whether it be a PIN for a bank card, e-mail address, phone number, passwords, all the information which can be traced back to us. I am thinking about creating a mixed-media piece for this, but at the moment I’m still working through the very basic ideas of the project. If you want to see behind the scenes images of what I am up to and other things I have been doing, head over to my Instagram ! I was lucky enough to obtain a place on the Foundation Art, Media and Design course run at Caerleon Campus back in 2010 after being made redundant from my full-time job. Getting onto this course changed my life and gave me hope that the career I wanted could be achieved. What I hadn’t bargained for over the year that the course ran, was to make so many good friends, learn new skills that I never even thought about and have the help and support of the fantastic lecturers who really listened to me and made me feel that I mattered as an individual and part of a team. The course offered me the chance to try out so many new techniques, from creating a stop motion video, 3d art, sculpture and using song lyrics to inspire fashion. The course taught me that inspiration can be sought from so many different, unlikely sources, experimentation in your thought processes can take your project from one dimension to another. It has affected how I approach life in general, from how I work on a day-to-day basis, to how I plan my own projects. I am a lot more creative than I used to be, and that is not because I wasn’t a creative person before the course, it’s because it gave me the confidence to take my ideas from my head and to actually create from the ideas. The course has taught me that mistakes are often the beginning of new creations and should be embraced, I’m not so scared of making mistakes now, and often learn from them and create from them. The reason I chose to study Foundation Art in Caerleon Campus was because I like the setting, the university has a lot of history, pretty architectural detailing, the facilities that were offered (hello Darkroom and film processing and printing! ),and the studios were bright and sunny, well-lit and the perfect place to experiment with art. The lecturers were not worried about us making a mess, and actively encouraged us to make the space our own, pinning things to the walls, hanging things from the tables and ceilings, anything that could help our creative flow. The other reason that I chose Caerleon as my place of study was down to its location from my home. I live in Pontypool and at the time I couldn’t drive, I was having driving lessons, and had to catch the bus everywhere. To get to Caerleon on the bus took about an hour, getting 2 busses and cost me around £30 a week to get back and for. The only other place I could have studied the course would have been Treforrest, and according to Google maps, would take me nearly 2 hours in travel, on public transport to get to. That kind of travel time would have impacted on my study time and would have had an effect on my attendance too, as missing one transport link would have made me miss lectures. it would have also caused me to be hugely stressed out, limit me to what I could physically create and cause problems with transporting any materials that I might have needed. Shutting the course will impact on people like myself, who want to learn and be able to stay in our own homes. I wouldn’t consider going for a job that meant I needed to be uprooted from my home unless I wanted to, so why should going to university be any different. It will put off a lot of people who don’t have easy access to transport, might have families and jobs that need their time. I was lucky that I had a job to support myself through the course and had the time to travel between my home, uni and work easily. if the course was based anywhere else then I would have had to consider moving, giving up work or not even attending the course. The Foundation course feeds into other courses held in the University, I got accepted onto the Photographic Art degree this way. If I had not have had the opportunity to be part of the Foundation course then I would not have filled a place on my degree, there would be one less person on that course and one less student’s funding coming through the doors. I can’t remember the numbers of students on my degree course exactly, but I believe there were around 45 of us, out of that number, around 12 of us had come from the Foundation Art course, that is a huge percentage of students that the degree course would lose and have to find from other sources. There are far-reaching consequences too, where shutting the course is concerned. The local area, which is not particularly affluent, nor is it at the bottom of poverty, would suffer. Students will not be coming to the area, going out in the area, shopping in the area or renting homes in the area. The pubs, local shops, community will suffer. Even the university itself will suffer from not having a wide-ranging mix of students coming through the doors and interacting , helping and inspiring each other. Going back to personal experiences, I would not be where I am today if I had not studied Foundation Art, Media and Design through Caerleon Campus. I have been able to complete a degree and am now looking at furthering my career in art, combining it with helping people and applying my knowledge to day to day tasks. Art is such an important subjects, it’s not just about creating “pretty pictures”, there is a depth to any art, whether its conscious, subconscious, easy to understand or has complex meaning behind it. There is an emotion attached to all art, from the emotion of the creator to how looking at a work of art can make a person feel. I do not believe, for one second, that shutting this course will have any benefits to anyone, whether it is a lecturer, a student, the local area, the finance side of things, or other courses. IT MAKES NO SENSE TO SHUT THIS COURSE. Please, if you value art and creativity as much as I do, click the link below, and sign the petition…your signature counts. I managed to get a few pages done in my Anti Journal last week, and also make a start on my Personal Art Journal which I had been wanting to start for a while, due to absence from work as I came down with a sickness bug that left me feeling really poorly and lacking in energy. All I seemed to have the energy to do was crawl out of bed and down onto the sofa and cwtch up with my pencil-case and creative books (and the puppies of course!). So in the 3 days I was off ill I managed the following pages…. 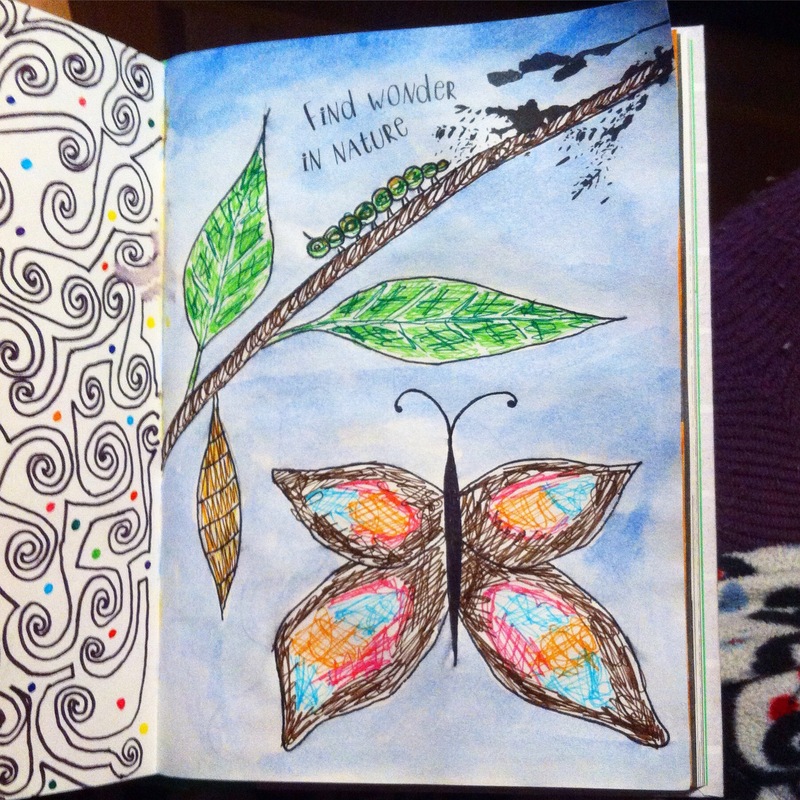 My inspiration for this page came from the metamorphosis of a caterpillar into a butterfly. I have always been astounded at how one creature can turn into another over time, its kind of like a natural Pokémon! As a child I used to collect caterpillars, watch them turn into chrysalis’ before hatching out into butterflies and letting them go free and it always felt a bit magical to watch these beautiful creatures emerge from these leathery looking hard cases. So that was my inspiration “Find Wonder in Nature” – the life-cycle of a caterpillar. I used Triplus Fineliner pens to create the drawing and add colour to the shapes and watercolour for the background sky as I wanted it to be just a wash of colour. I chose to “scribble” in the colour on my drawings as I felt that the block colour of the felt pens I like using would be too heavy for this image, I wanted to keep the images light and playful and create a sense of movement whilst still being able to add some detail and have control over the texture of the image. I started on this page ages ago and finally got around to finishing it last week. 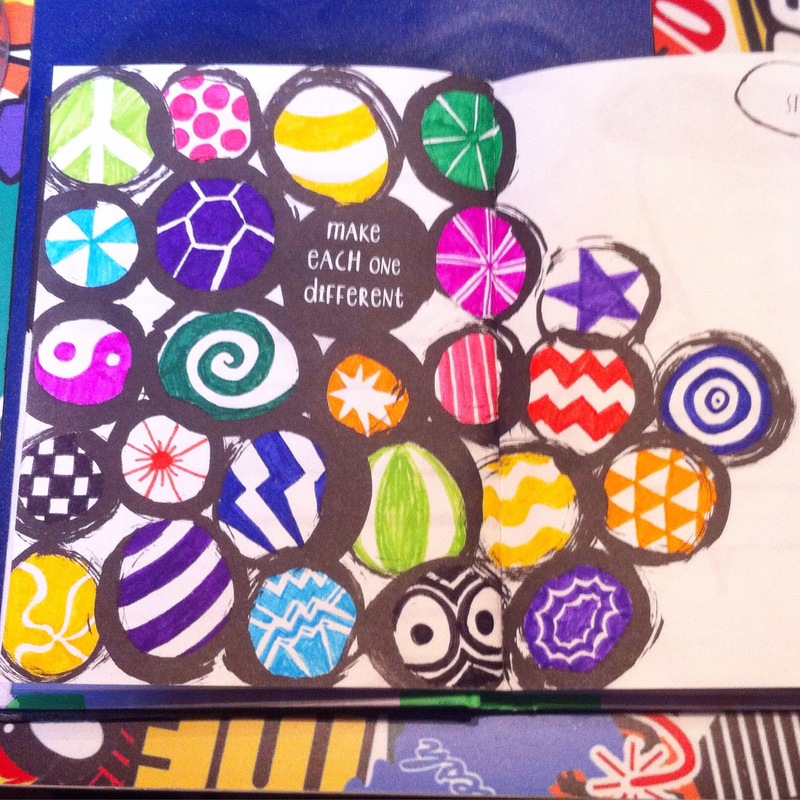 I didn’t have any real idea of what direction to go in for this page I just knew that I wanted to create something that could look like the patterns from inside marbles or replicate small bouncy balls so I kept that in mind. This page seemed to be the most difficult so far as I ran out of ideas for each circle before I was even half way through and had to keep leaving it and coming back to it in order to finish it. 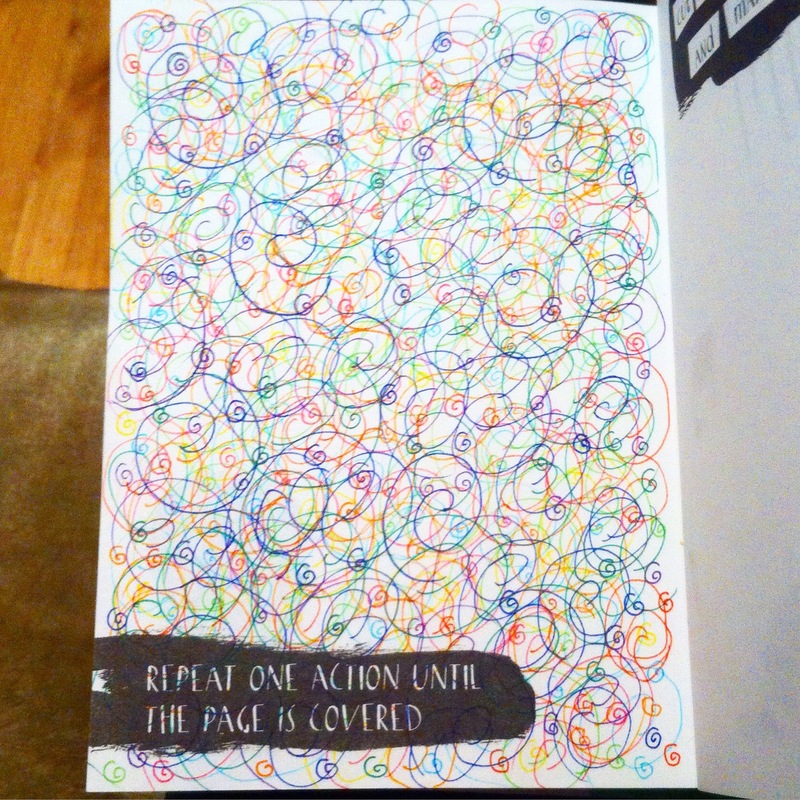 I used felt pens to create this page. 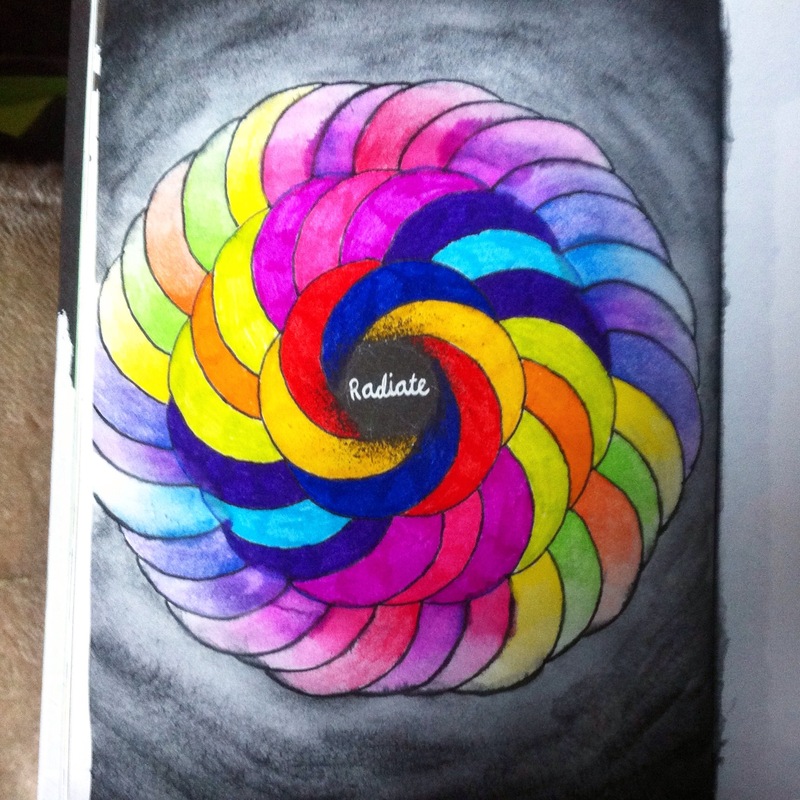 Radiate to me conjures up images of the sun, heat and circles and that is what I tried to convey in this image. The sun gives off both heat and light and light is made up of a spectrum of colour which I wanted to show. 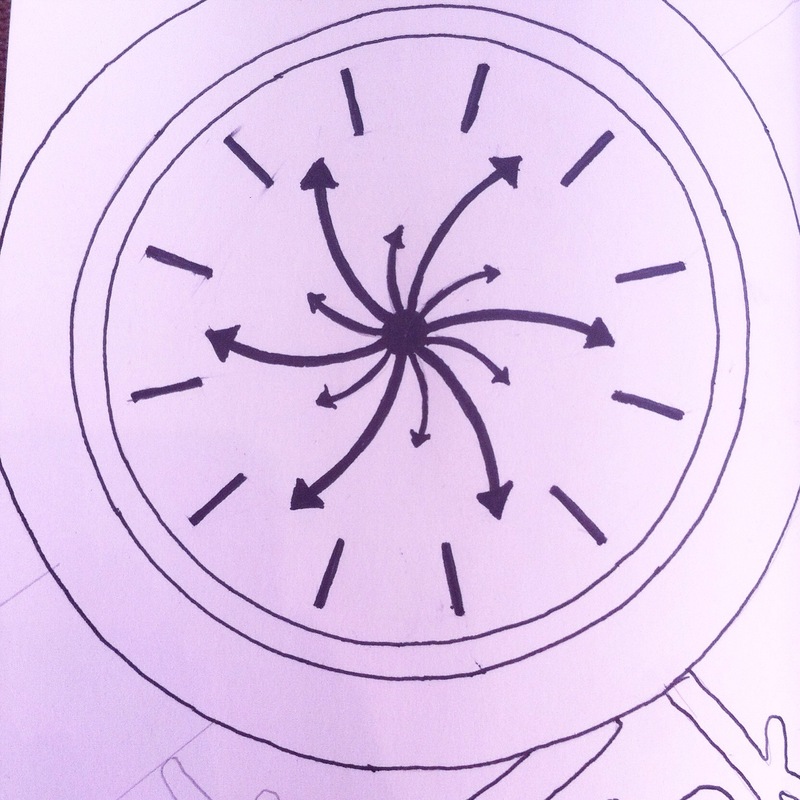 I used circles to create a spiralling pattern around the centre circle as the typical spiral radiates outward in motion. I decided to use a black for the background, graduating it in-depth of tone from the lightest tone toward the pattern and getting darker toward the edges to convey a sense of light. I used felt pens to colour the 2 centre layers of the pattern and a mix of felt pen and watercolour to create the 3rd layer of tonal graduation. 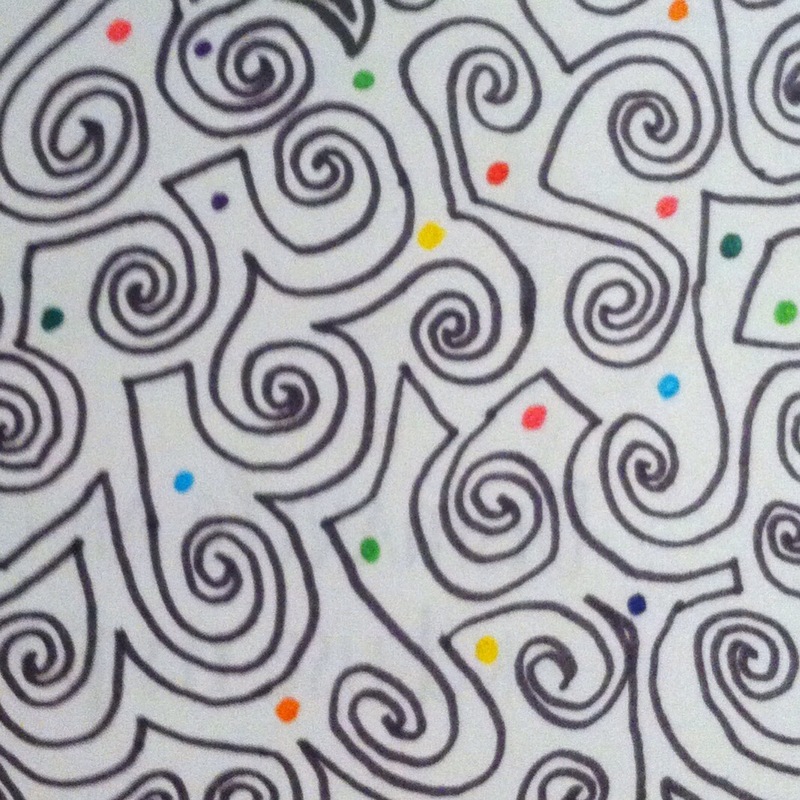 A gel roller ball pen was used to outline each section of the pattern. I used Staedtler Triplus Fineliners for this image. 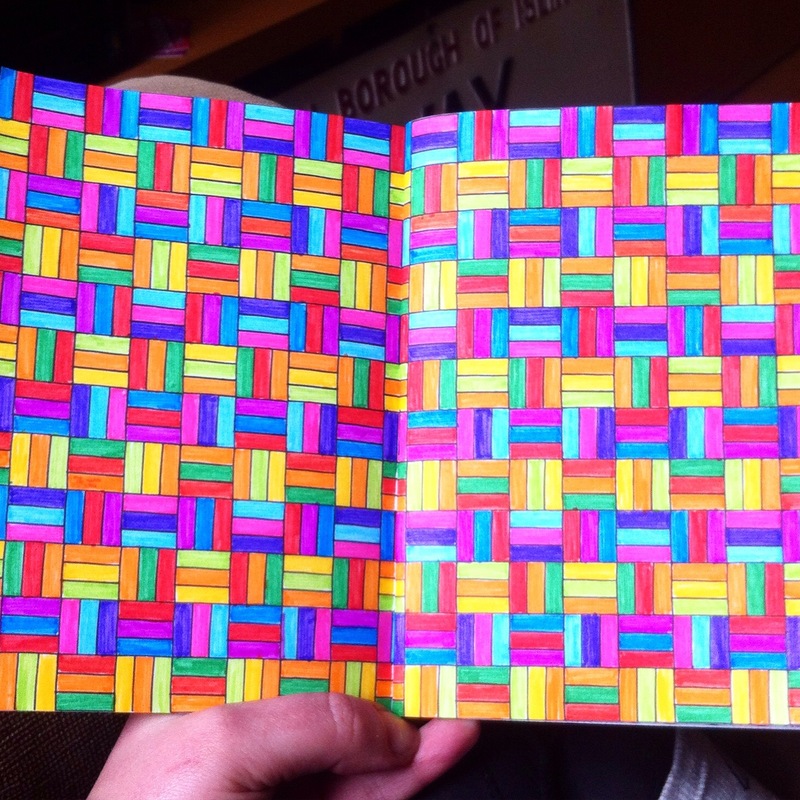 I started this page by drawing really uniform, different coloured swirls over the page, (if you look hard, you can see them!) but didn’t really like it so after leaving the page and thinking about it for a while I decided to go back over the page and repeat the swirl but in different sizes over the top of what I had already done, getting the swirl to overlap with other swirls. 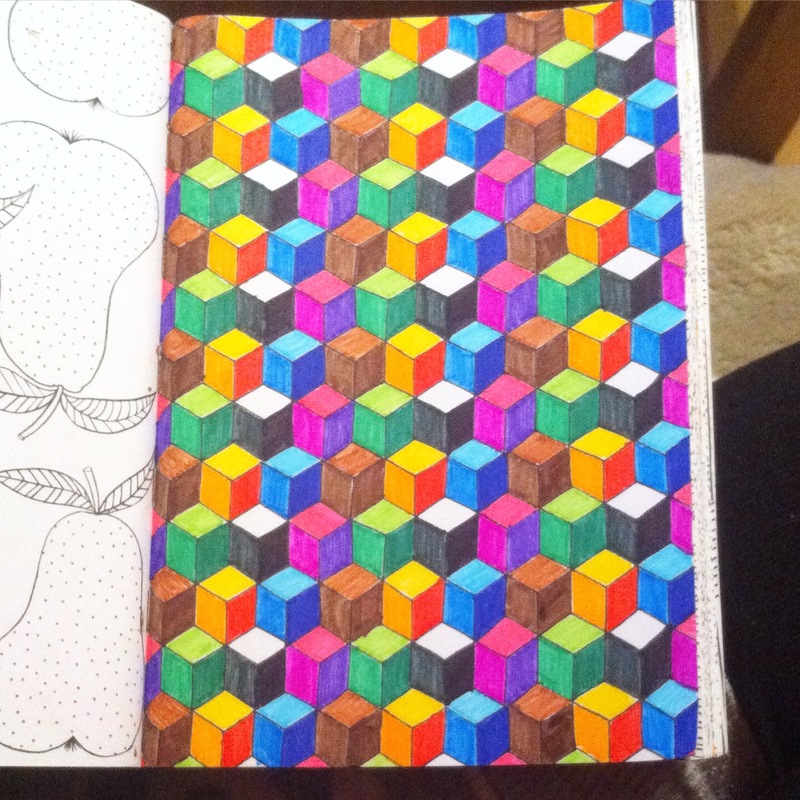 I like this page loads though I’m not sure I have finished with it yet and may go back to add more to it at some point. I used Staedtler Triplus Fineliners for this page. 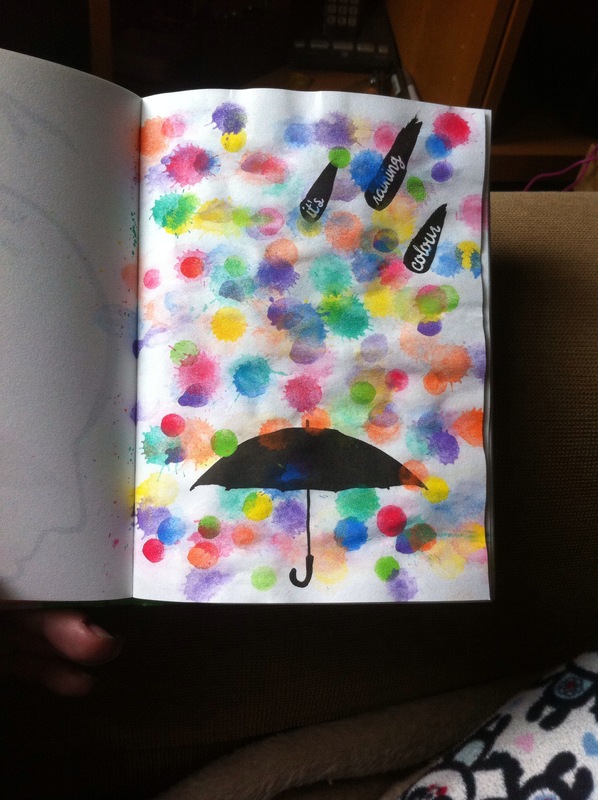 I had a few ideas about how I wanted to create this page but decided to go with colour drips I decided on this as I wanted the page to look like it had been rained on. And thought the page looks simple it took an age to complete! I had to wait for each set of colour drips to dry before I added the next lot of colour as I didn’t want the colours to run into each other! I used my Aquash brush and watercolour paints to create this page. The Aquash brush was the best choice as it has a tank to hold the water and a brush end, a bit like a pen. I was able to pick up paint colour onto the brush and hold it over the page while squeezing the body of the brush slightly to control water flow to the brush and creating drops. I am pretty happy with this page so far but think that adding more depth to the drops may be a good move, and also adding a further sense of “rain” by exaggerating the splashes that were created. For this page I used Aquash watercolour paints and brush. This one is kind of self-explanatory and I’m not sure if I like it too much as it seemed to me to be the easy route to getting a page done. That, and my Instax Mini 8, which I took the images on, didn’t seem to focus very well so the images are all blurry. However, it is done and was more of an experiment to see how my camera would react to indoor photography. I might change the page at some point. I decided to start a personal art journal as I have been missing my experimental sketch books that I used to have when doing my Foundation course. I always enjoyed being creative and experimenting with ideas on those pages and felt that this was something to re-start again. That and getting the encouragement from my Wreck This Journal and Anti-Journal to continue with letting the creativity flow and continue. I’m not sure I am going to title the pages yet as sometimes I have no specific idea of what I want to create, yet I know I want to create a certain mark on the page before me. 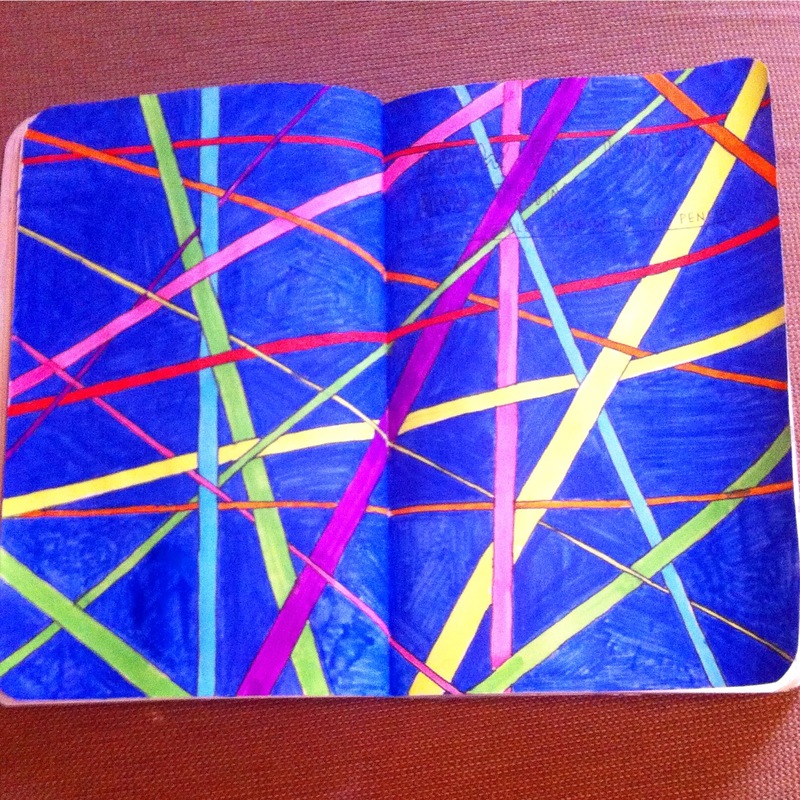 …so here it is, my Personal Art Journal. This was the first page I created, it was a damp and miserable day, and it was stupidly cold (possibly in part due to me running a temperature and being ill). I was missing summer and the bright, colourfulness of the season so I set about with my watercolours, creating a graduated sunrise/sunset sky. After waiting for the page to dry I wanted to add a pattern to the page so I let my pen decide where to go, I wasn’t really focusing on what I was doing, and came up with a pattern of layered petal shapes. 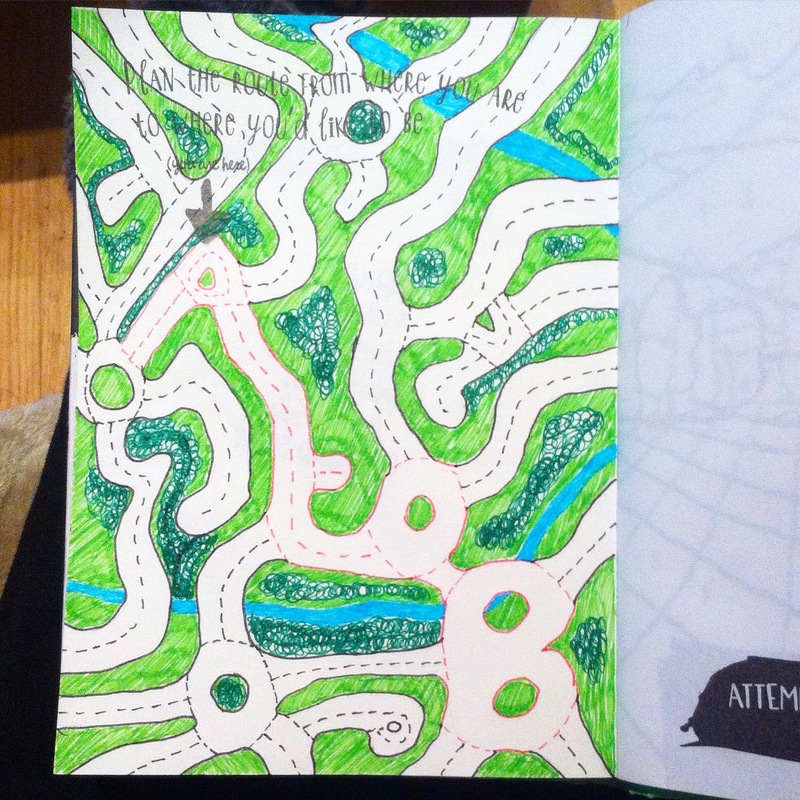 I added the dots and the wavy lines at the end as I felt that the page could do with something to lift it more. It’s strange to say it, but the image reminds me of a pineapple, the one fruit that I associate most with summer, and I had subconsciously included that into my image! This page was created not long after the first, and though I was still ill, I was starting to feel better in myself. I had a dream about shapes, swirling and moving about, changing and flowing and woke up so calm and refreshed that I wanted to try to capture what had been in my dream. I chose to use bright colours to capture the energy that I had felt upon waking and the circles, triangles and wavy line to capture movement, and to represent water flowing as that was how it had appeared in my dream. perhaps this flowing movement had aided my calmness when I woke? The image took an age to create as every time I stepped away from it to look at it, it felt like there was something missing, even once I had finished, however now, looking at it, I am entirely happy with how it turned out and still makes me feel calm and refreshed. I feel like I have captured what I set out to and that it is a good representation of my dream. Anti Journal Pages and the reason for my absence. I have been MIA for the last few weeks and have not had a chance to blog about my completed pages for the last few weeks, except for uploading to Instagram (and the last of those pages was completed and uploaded 2 weeks ago…). The reason for this absence…. 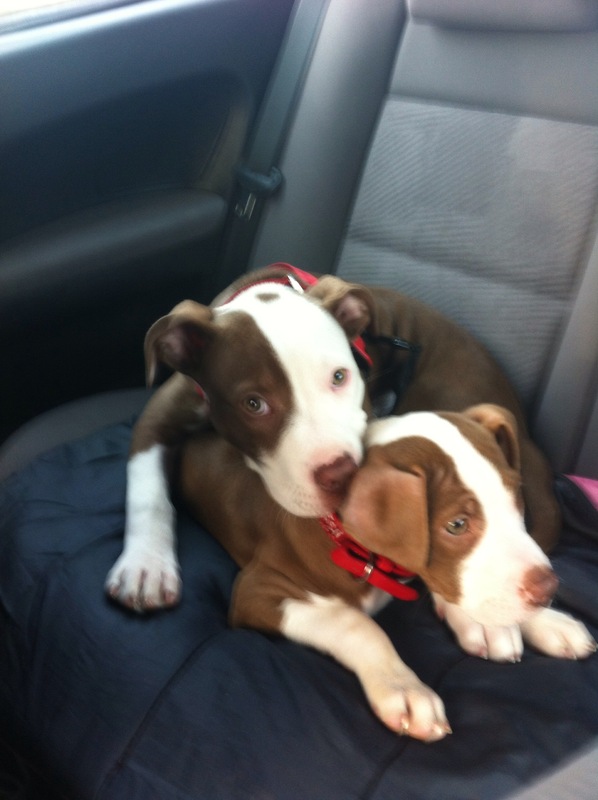 This pair of cuties…. brother and sister, mine is the smaller of the two and we are looking after her brother for my step daughter while she is on holidays. 🙂 And its not that I haven’t started any pages…more that I haven’t finished any yet…however, I do have some pages to share that were completed before the arrival of our puppy…. here they are!!! 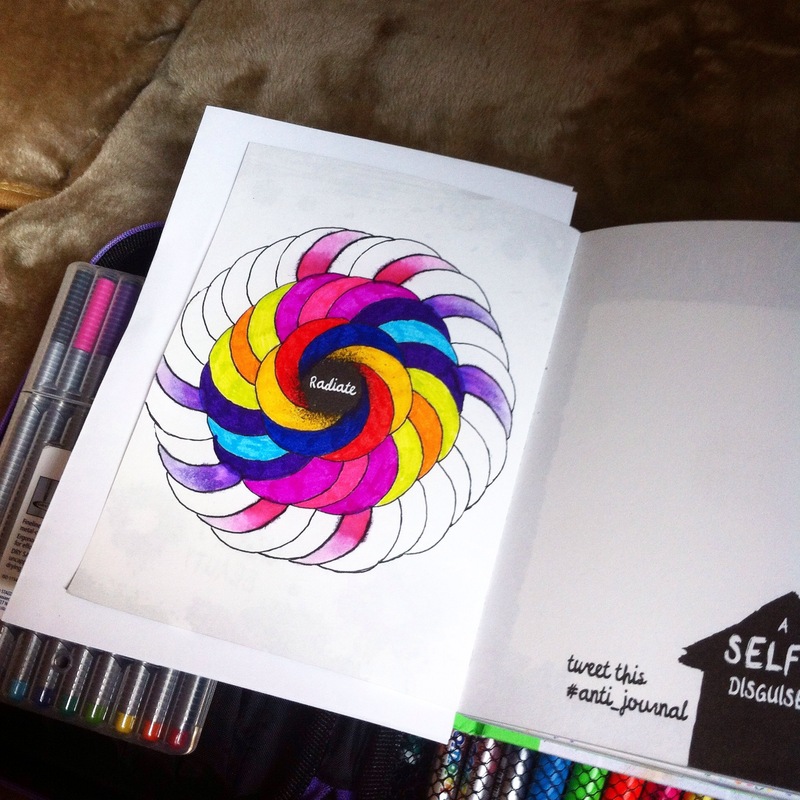 “Try to Draw Perfect Circles By Hand” – this took me hours! I was going to create a picture from the circles, grouping different coloured ones together to make shapes but decided in the end to doodle tiny circles in random fashion over the page instead. 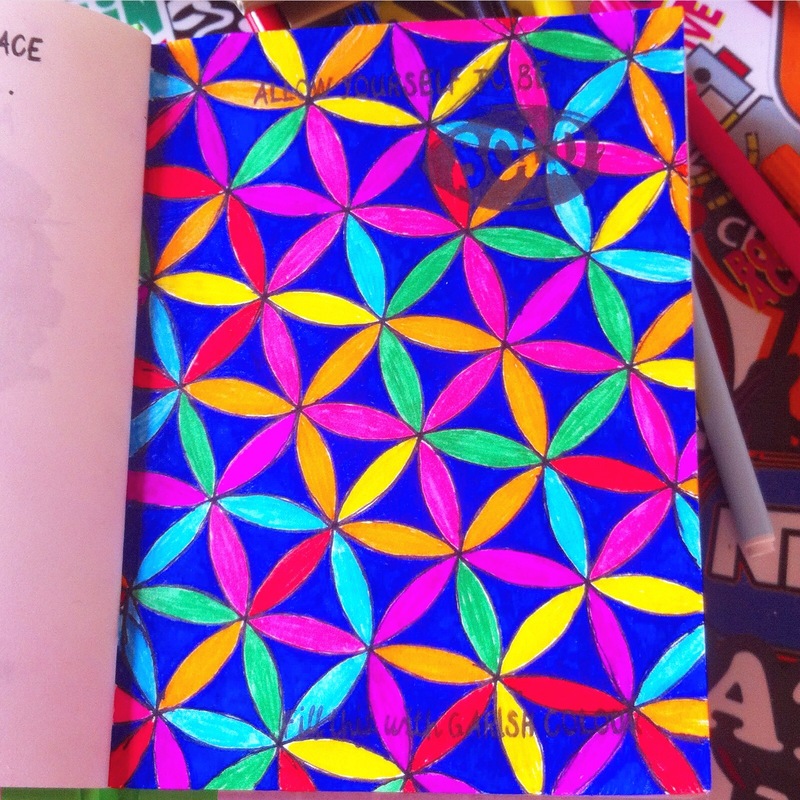 I love the colour clash-brightness of the page and how I have managed to fill the whole page pretty evenly with circles! I have no idea how many I drew, nor do I have the desire to count them! Lol!!! 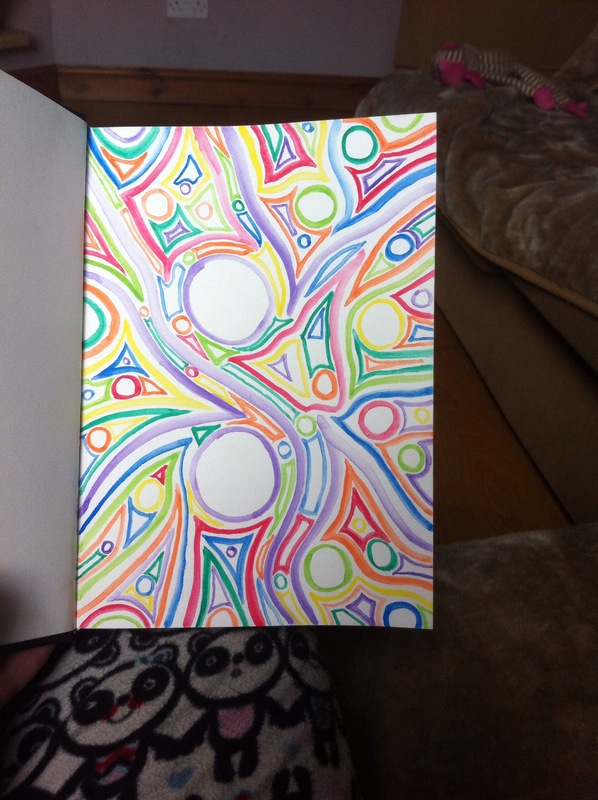 I used Staedtler Triplus Fineliner pens to draw the circles. 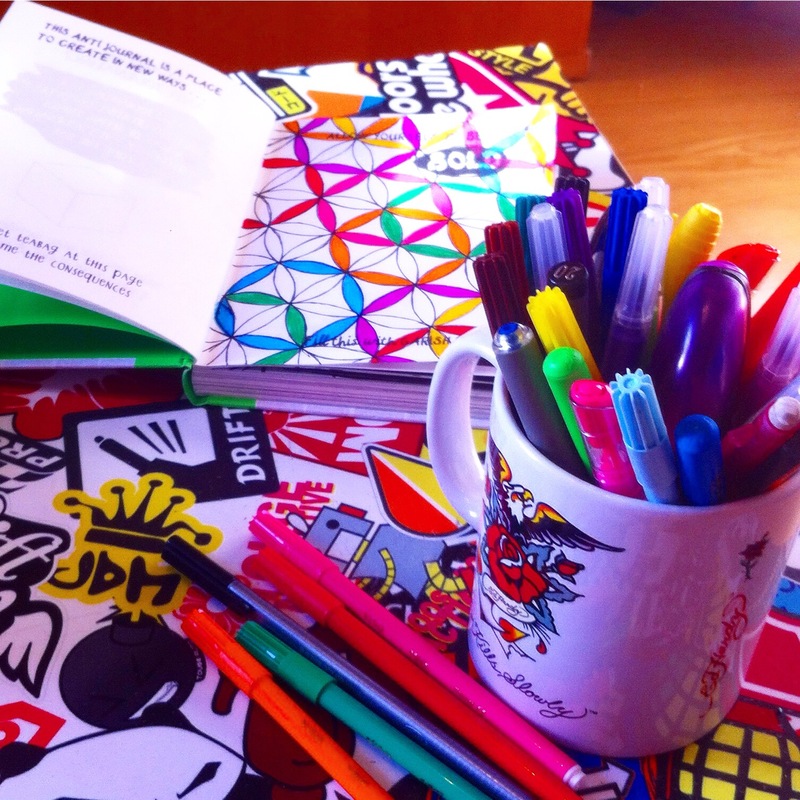 “Today is a Blank Page, Fill It Vibrantly”. I decided to use the equilateral triangle shape for this page as I really like the shape and had a plan to use triangles on this page as soon as I saw the prompt! I made the shape from some cardboard creating a template that I placed on the page and drew round, overlapping the shape as I went to create a layered look. I used a generic gel rollerball pen to draw the shapes and used a felt pen, in hot pink, to colour any spaces not covered by any of the triangle shapes – the background. I then used several makes of highlighter (the vibrant part!) 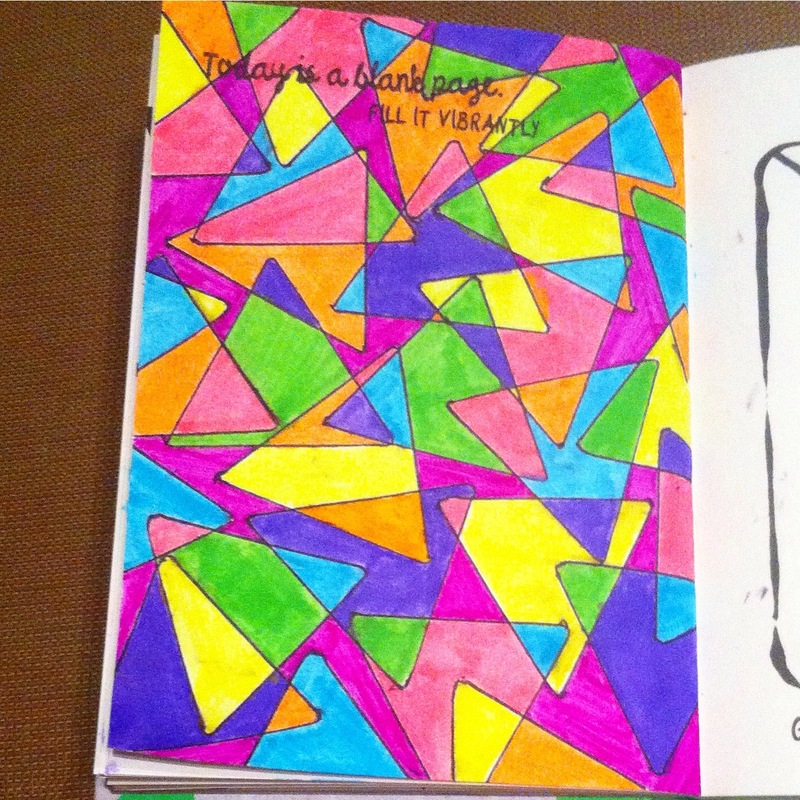 to colour in the triangles, changing the colour where an overlap of shapes took place. 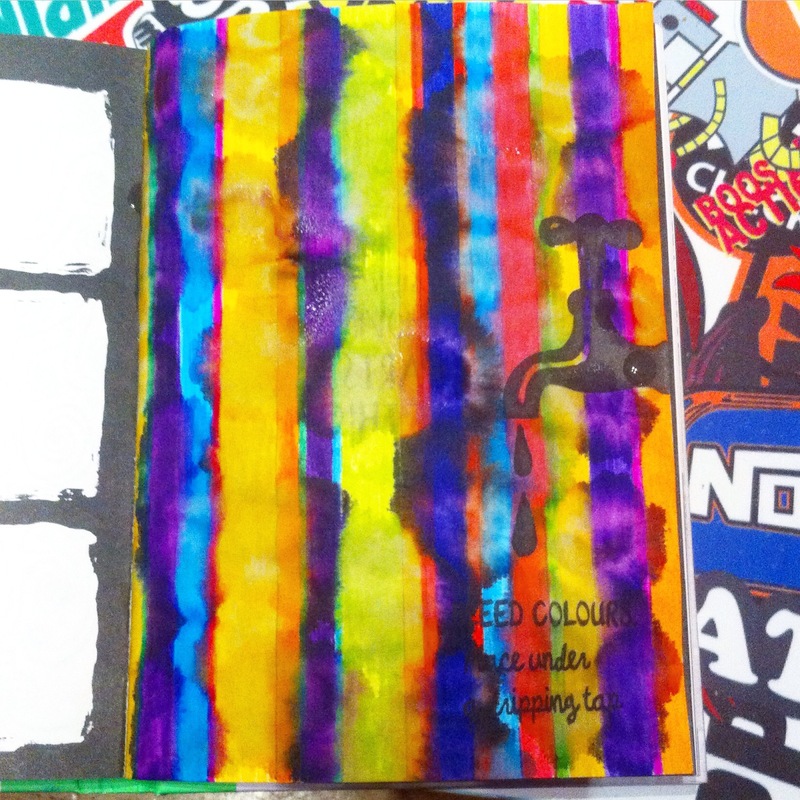 “Bleed Colour – place Under a Dripping Tap”. This photo was taken while the page was still wet and I can honestly say that dry, it looks even better (I will add a photo of it soon!) I struggled with this page initially and was worried that I would ruin the book by introducing water to the pages but I got around that by placing a few sheets of A4 paper behind the page before dripping water onto it so that the water only saturated that page. I chose to colour stripes of differing width with felt pens as I know that felt pens can bleed a lot better than other mediums, its to do with the pigments and chemical make-up of the ink. After I had coloured all the stripes I spent some time getting the tap in my kitchen to drip speed that I was happy with, not too fast and not too slow. I moved the page around under the drips so as to get at least one drop of water over each line to merge and bleed the colours together. As the drips hit the page the inks were pushed outwards and merged together and as they dried the colours kind of got sucked back toward the centre of where the drip had hit. I loved the effect that this had on the lines and now it reminds me a bit of tie-dye. 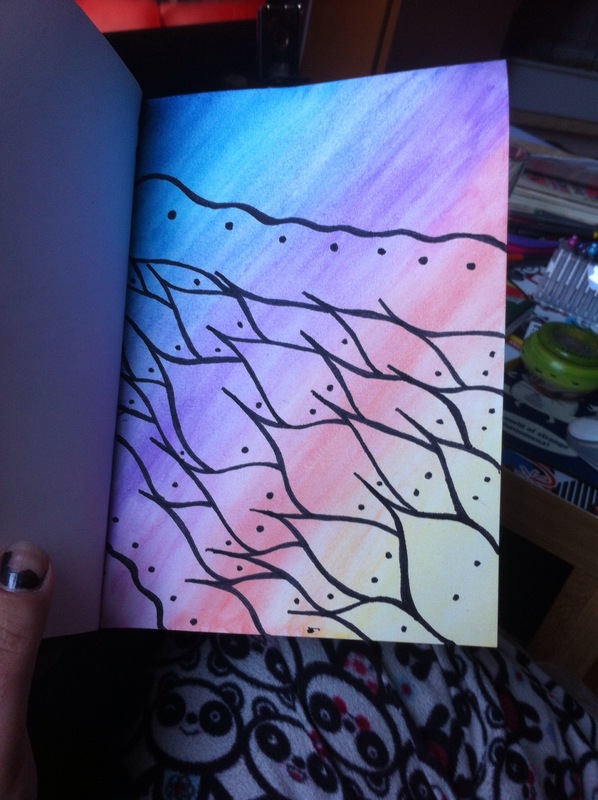 Id love to use this effect with some lighter colours or try blotting the paper as soon as the drips have hit. Definitely something to try in the future! I chose the word Love based on it being one of the most used words we say and probably one of the words that has so many different meanings depending on how it is used… there is the traditional “I love you”, then “I love this/that/the other object” where Love is in place of “strongly liking” the object. Sometimes, that word can be overused and become meaningless and I wanted to depict that but at the same time be able to portray it as its word suggests to me, bright, vibrant and happy. 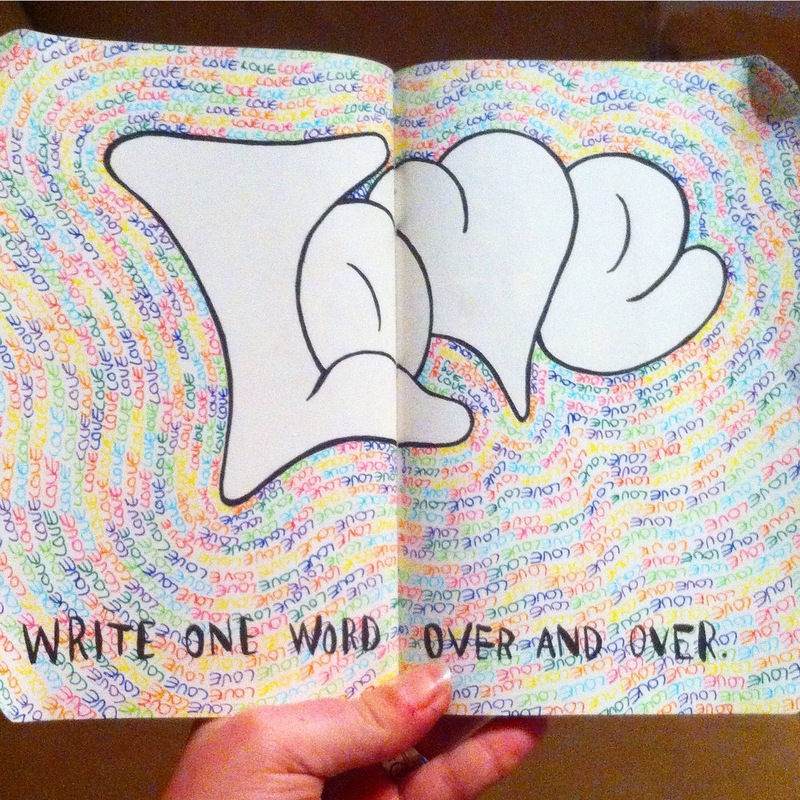 I wrote the word “Love” in big graffiti style lettering and used Staedtler Triplus Fineliners to write the word over and over as the background, in bright, vibrant colours. this page seemed to take ages as I kept having to swap over colours and write as neatly as possible, making all the background words the same size. Half way through the page I nearly gave up though, as my hand was getting achy and I started to feel a bit fed up of writing the same word, but I’m happy that I stuck with it and really like (love!!!) how the page turned out! 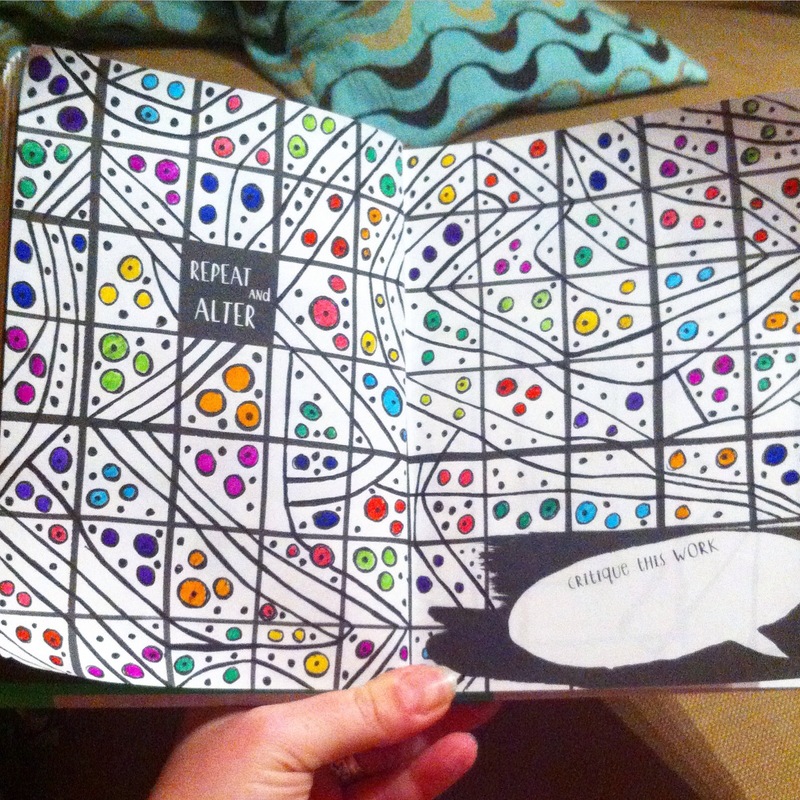 I chose this page as I really liked the first square, (the one with the orange dots, under the title “Repeat and Alter”). I decided to repeat the pattern and then on other squares use the elements from the first to alter each square. The elements are 3 lines, one circle with a centre dot, two blank circles and four dots. I had no pre-conception of how I wanted the page to look once finished, however I did decide that I wanted the lines to flow into neighbouring boxes so that the pattern created would link together. 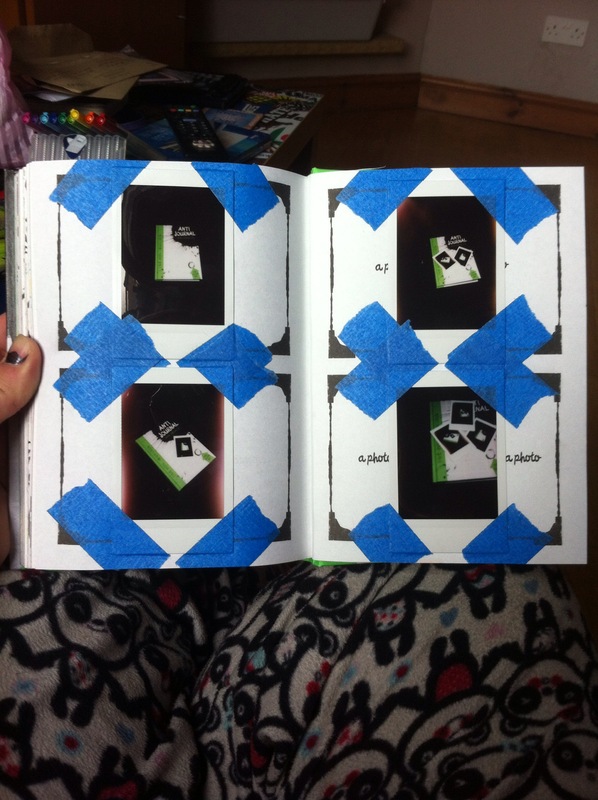 I filled each square in black, creating the lines and shapes before choosing to add colour once I had fitted all the elements into each box just to add further interest to the page. This is the “Allow Yourself to Be Bold” page. I chose to use circles to create a pattern that in itself is as bold as the colours I chose to fill the design with. I chose circles as I have a bit of a soft spot for that particular shape though I really have no idea why. And I really like how you can create designs by overlapping the circles to create “floral” shapes. I outlined all the circles in black felt pen to make the shape pop a bit and then filled the shapes in with bright coloured felt pens. I chose to colour the spaces between the “flowers” with a royal blue to act as a background for the shapes. 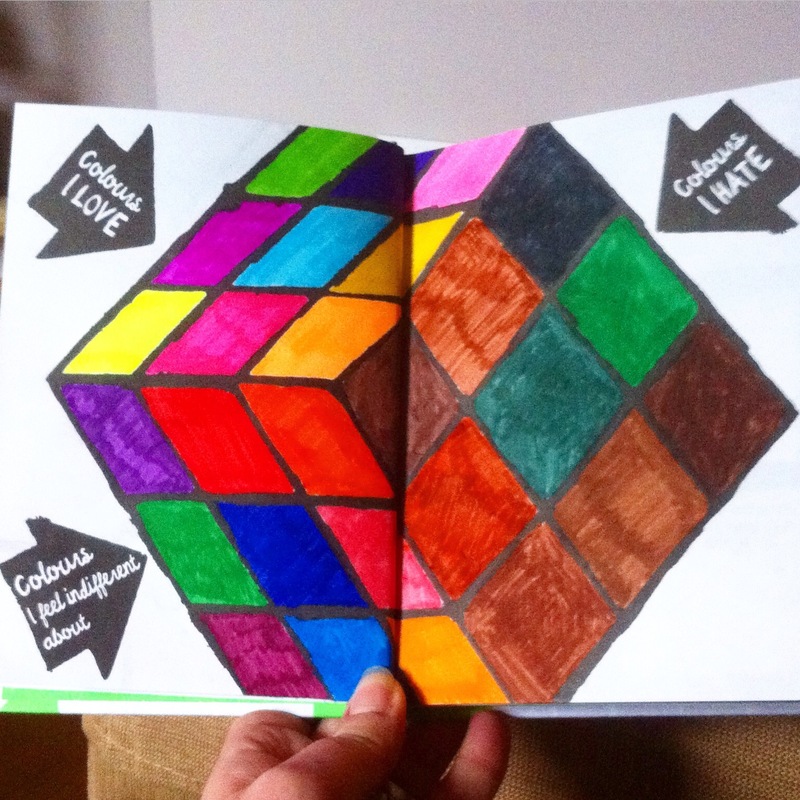 This page was really hard for me to create as I don’t think there is any colour I truly “hate”, not even brown…all colours have their moment, and in the correct setting, all colours are beautiful. However, I am a lover of all things bright and bold – Neon colours are my favourite, so I worked from there as a starting point. I then worked my way into the colours I feel indifferent about as to me, they are just darker versions of the brighter/bolder colours I gravitate towards normally and the only reason I chose browns as the colours I hate are that these are the only felt pens that I never use and never seem to dry up – seriously, some of these felt pens are from when I bought markers for my Foundation Degree $ years ago!!! It kind of made sense, from that reasoning, to use brown for the colours I hate. 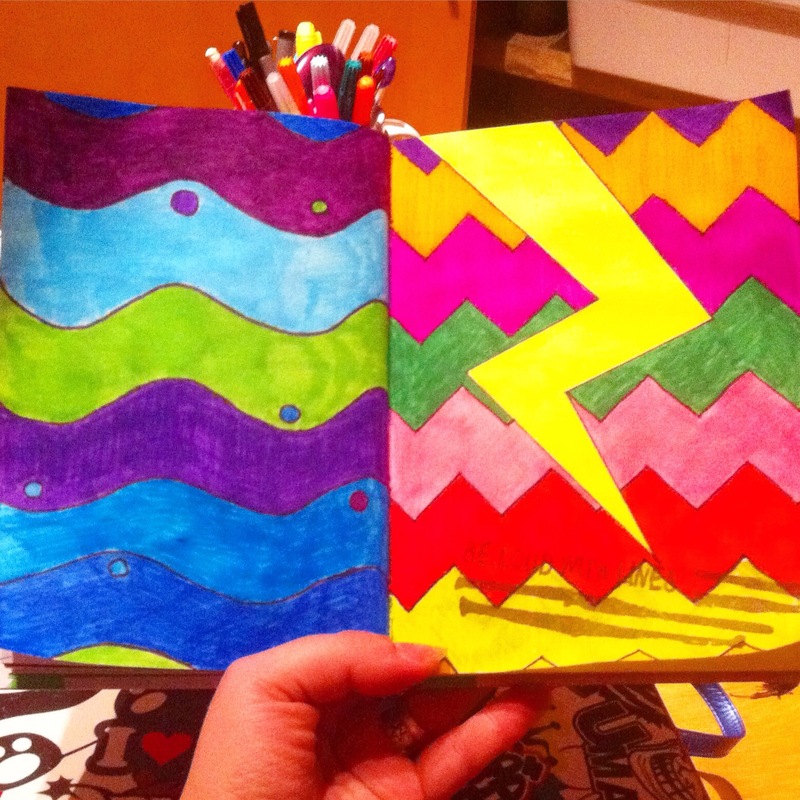 For this pair of pages I chose water and thunder as my inspiration for the lines. On the left I tried to create wavy lines that mimic the flow of water and coloured them with calm, soothing colours, whereas on the right I chose to create zig-zag lines, with a lightening bolt through the middle to represent noise and loudness. 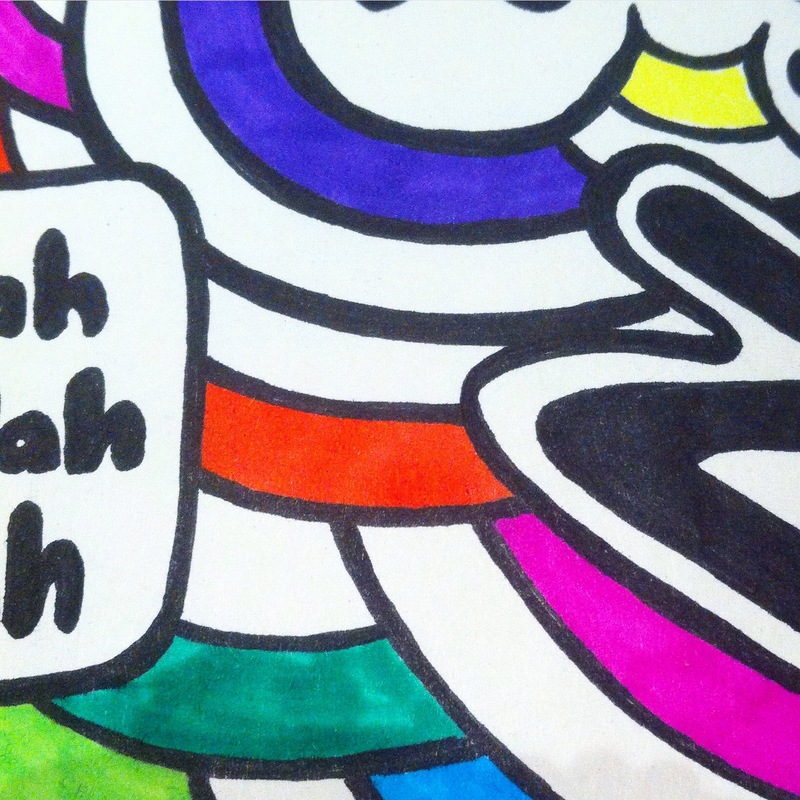 I coloured this with really bright, in your face colours in order to represent the noise. And this is the full-page! 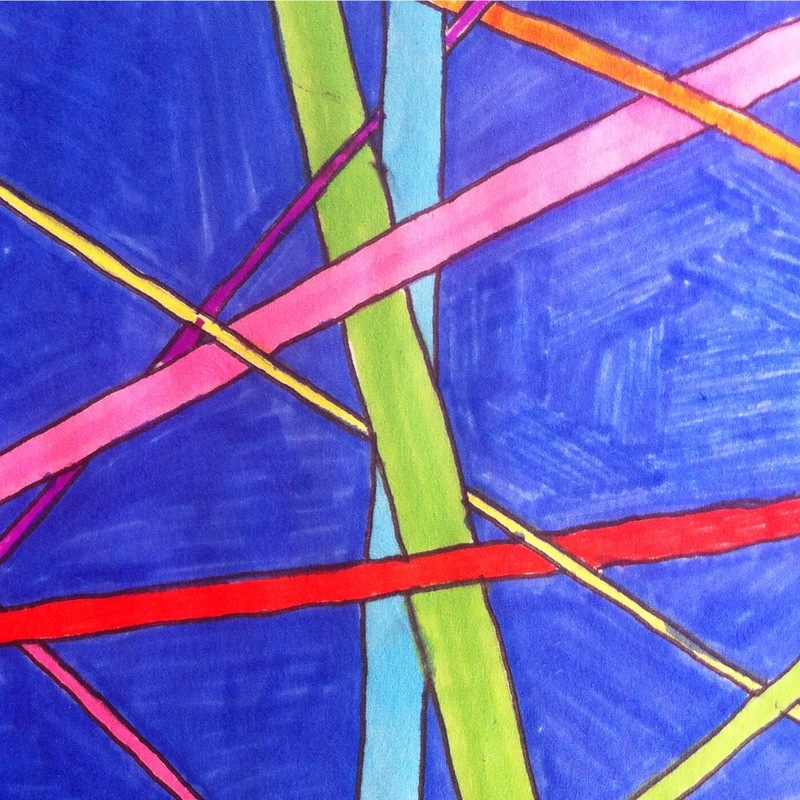 I chose to do “ribbons” of colour that overlap and weave around the other lines as the subject for this piece. Originally I wasn’t going to have a background colour but towards the end of colouring the lines I felt that it needed something to make the colours “pop” so chose this blue colour. 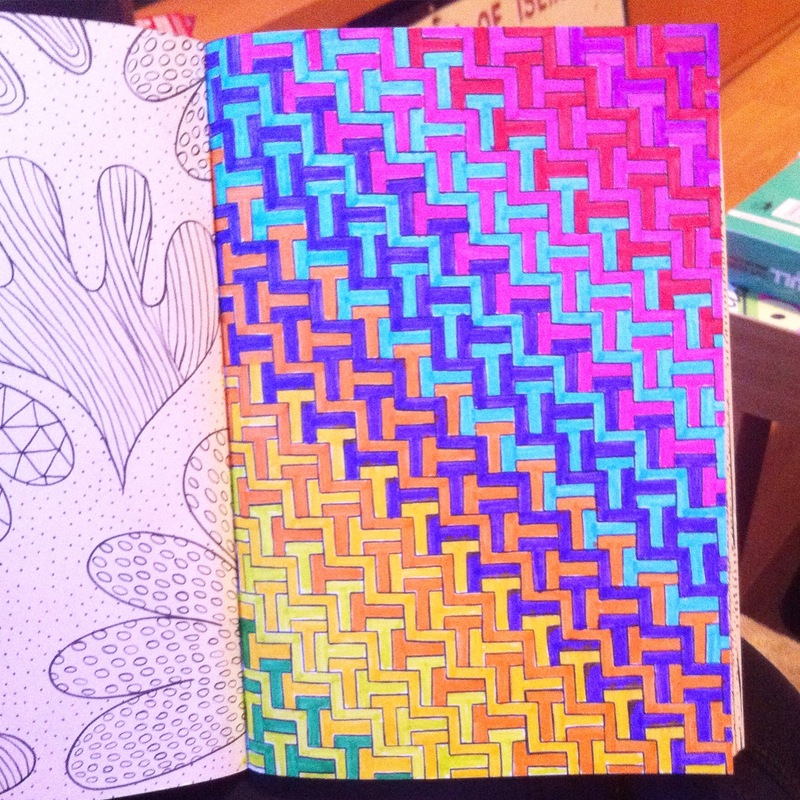 I used felt tips for the colour and chose to use an unbranded gel pen to make the lines. I really like using felt pens as it is quick and easy, the colour is stable and the saturation more consistent than when using pencils… well, until your marker decides to run out toward the end (note the middle bottom section which isn’t as evenly coloured as the rest of the blue sections). That is probably the only thing that I’m not entirely pleased about with this image and can see myself re-colouring it at some point in the future! 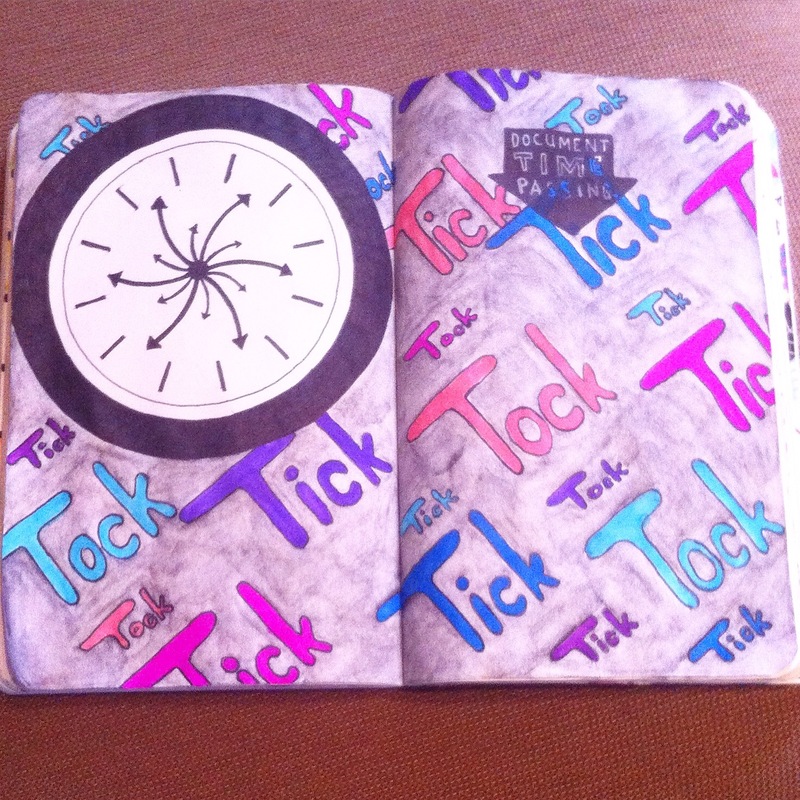 I went with a clock face theme and the words “tick tock” written over and over in different sized letters. This image was inspired by school exams and times when you are bored, all those times when you are super aware of the minutes passing by, when you can hear the tick tock of the clock, minutes can feel like hours and hours can feel like minutes. 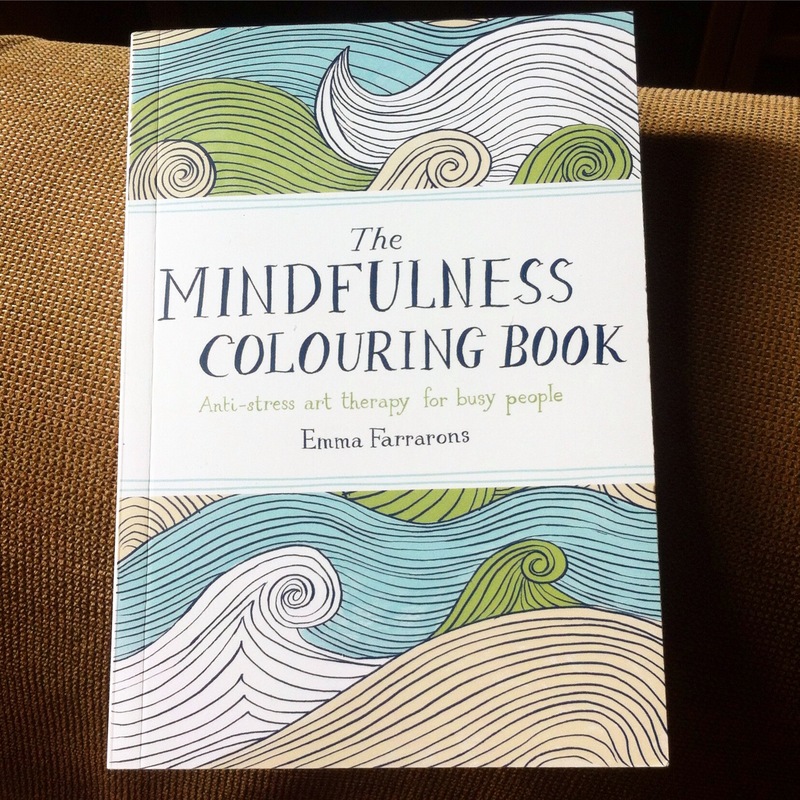 I used my Staedtler Triplus Fineliner pens for the outlines of the image and generic felt pens to colour the words. For the background grey colour I used Aquash watercolour pencils and water brush. 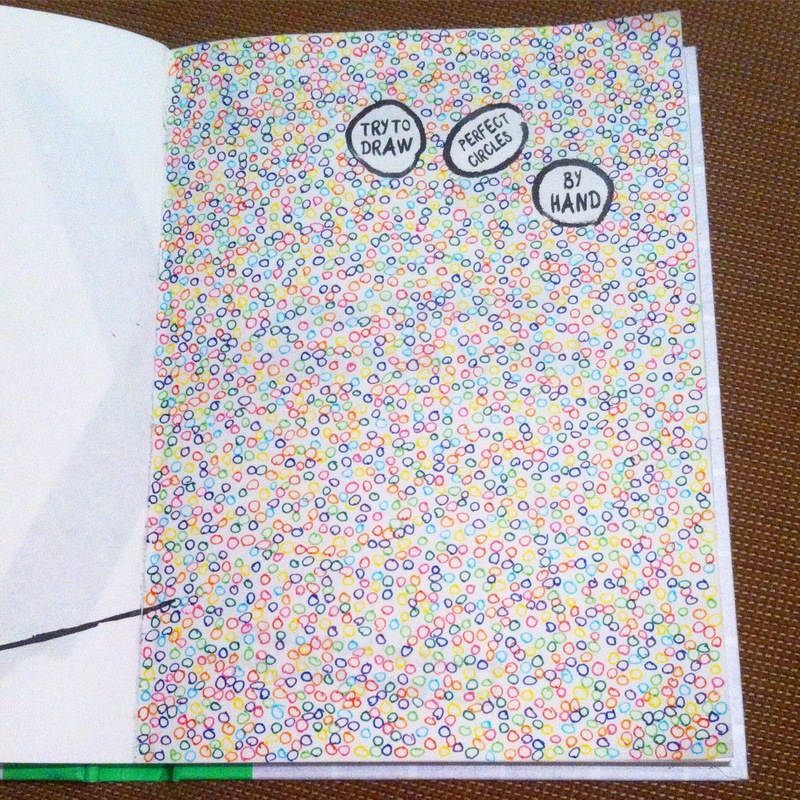 This is the page I created for “This Page Is a Sign, What Do You Want It To Say?”. 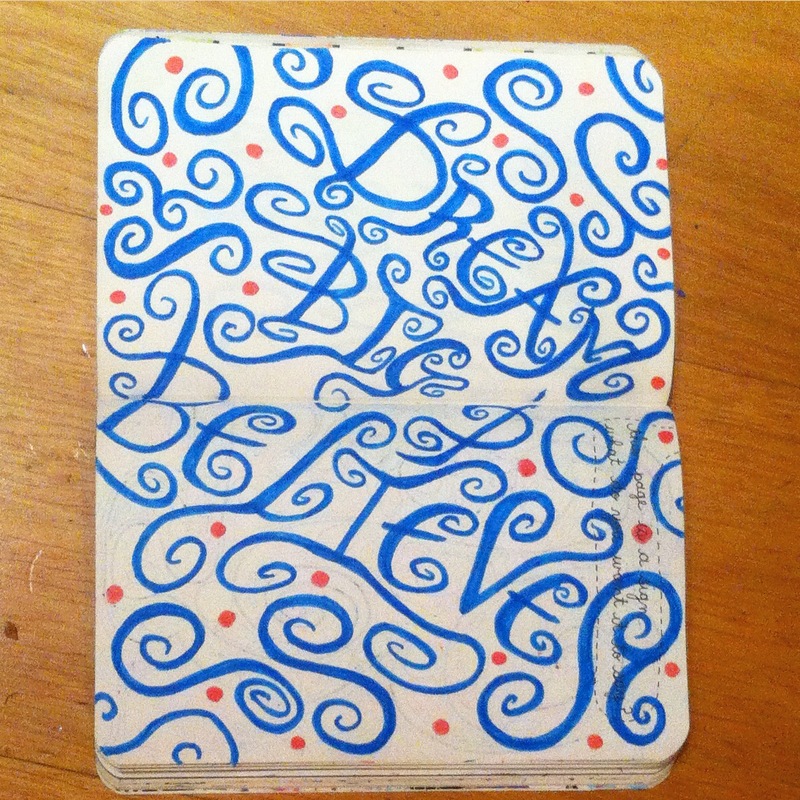 I chose the words “Dream Big and Believe” as it is a saying that I try to remember when I need motivation. I chose to do the lettering in my handwriting and fill the blank spaces with swirls and dots as it seemed to fit the theme of the quote really nicely. I kept the colour theme to one shade of blue and one shade of pink, partly to fit in with the “dream” wording and because it just felt like the best colours to use for the page. 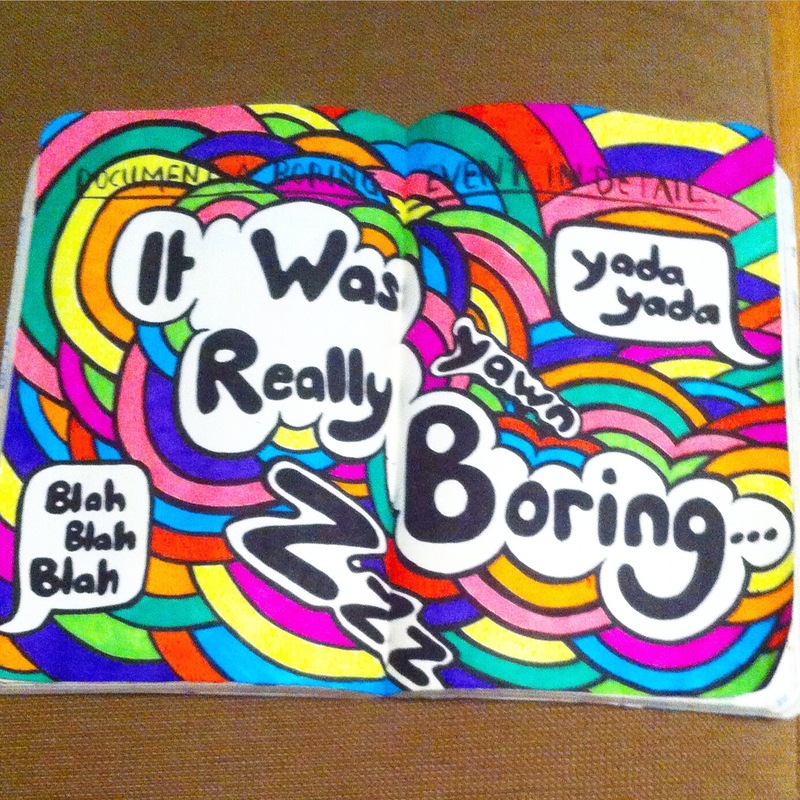 I decided to create the page using the phrase “It Was Really Boring” as when I get asked about a boring event that has happened that is how I normally respond. I used the speech bubbles with “Blah Blah Blah” and “Yada Yada” as when I have to recall things that were said I can never remember them and it seemed fitting for this theme! I also included the words “Yawn” and “Zzzz” as boring events seem to have the effect of making me yawn and feel sleepy, whether this be a uni lecture or a meeting or sometimes, even going out somewhere! I have already made a start on my next page after completing another which I will share next time! If you would like to see them in advance of my blog post then head over to my Instagram where I usually upload pics of the pages as I have finished them!